Tonight at 9: Who is Michael Brandon Hill? From New York to Oklahoma, gun control has stolen the headlines this week. 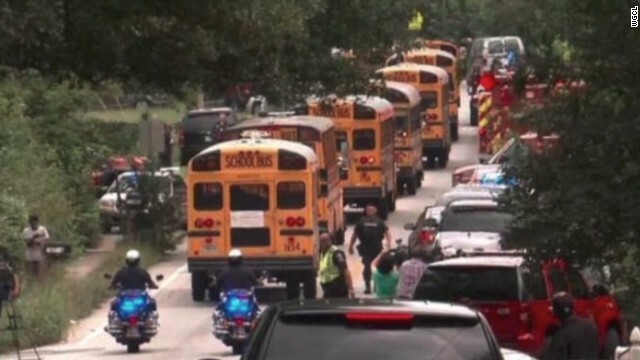 But as we learned from the 911 call that came amidst an attempted school shooting in Georgia, not all stories end in tragedy. On Tuesday, Antoinette Tuff found herself face to face with Michael Brandon Hill, an admittedly mentally unstable 20-year-old armed with an AK-47. With support from a 911 dispatcher, and a dose of old-fashioned compassion and human kindness, the bookkeeper at the Ronald E. McNair Discovery Learning Academy just outside Atlanta convinced him to surrender, and is being hailed across the country as a hero. But this story reignites a number of questions about the debate over firearm legislation and mental health, issues that have been left unanswered in Washington. In an exclusive interview, this evening “Piers Morgan Live” welcomes Timothy Andrew Hill, the brother of the Georgia shooter, with hopes of answering some of those questions. At 9, Piers Morgan also invites the principal of the school, Dr. Brian Bolden, to share his perspective on the nightmarish experience. Also tonight, as the Anderson abduction saga continues with new developments appearing every day, family members of Hannah Anderson will join the program with their insights on the recent revelations, the media frenzy, and the family’s recovery less than two weeks since James DiMaggio was killed by police during Hannah's rescue. I am amazed at the brother being so bitter about President Obama calling Ms.Tuffs. Wow! Why the reason we are getting obama care is his anger for his mother lack of care. Do you know if Hill has medical insurance? It appears that the main issue is mental health and how we deal with mental problems. Instead of focusing on gun control as the solution to every thing. Instead of our republican party trying to cancel Obama care we need to improve mental health provisions. This is not a race issue it's an American issue. The mental health system in this country desparately needs to be seriously looked into. I know from my own personal experience with my son. The person will only be admitted if he or she is going to do harm to oneself or others. They tell you to call 911 or the mobile mental health unit when your loved one is truly psychotic. Why wont they help before it gets to that point? I don't understand this logic. The mental health sysdtem is just a revolving door to these people who have a disease . A disease just like cancer diabetes etc. It is not about gun laws, it's about helping that person behind the trigger before it is to late. Very sad! When will the people in charge get what is happening. You have an opportunity to work with a mentally ill child and perhaps prevent a tradgedy like this from happening in the future!!! USE IT!!!! Pay some very much needed attention to the boy, who, with the help of a great woman, turned himself in!!! Give him some credit!! Take this opportunity and give the rest of the citizens who suffer from mental illness that they are NOT a lost generation and that what he and she and he did together will make a difference!!! You say it's what matters... so heres the opportunity to really make a difference!!!! Yes, she deserves praise, but he clearly deserves help and you have the opportunity to do it!!!! She is gracious and accepting of your praise but probably will be happier if you help the child whom she helped... Help him too! If you want to prevent it from happening, make it a success story! open your eyes mr morgan that guest was right. This was a race related killing of a innocent white man. Where are all the jessie jacksons and mr sharpton know?? no where to be found. And also your guest was right with what he said about george zimmerman case. Get your facts right before u go on tv and talk crap!!! How long did it take for Zimmerman to be charged? Every one believes that the killing of this young man is awful. Did it take weeks for these monsters to be picked up and charged. In Trayvon's case, he had every right to walk home without being harassed and killed by George. As for race, two are black and one white. Your right i think ever one of there parents should tell there kids that if some one is following you attack them that well end a lot of the problems. I tell my kid run and just think they always have a gun. Baby shot dead in stroller; 2 Georgia teens charged with murder no one called her and her white baby die and he didn't even have a drink or candy and no one cares to talk about this one much.